Update (November 29, 2017): WOW. Our fundraising goal for #GivingTuesday was $500 and with your help, we were able to bring in just over $1,600!! Our thanks to the generous late night donations in honor of Fallon Jade, Dawson Michael, Ainsley and additional contributions in honor of several children recognized earlier in the day. Our incredible and generous ACDA community more than tripled our initial goal! Update (November 28, 2017, 9:00 p.m. EST): We did it!! Thanks to additional generous donations this afternoon in honor of Amelia Lee, Avery Grace, Fraser Hamilton, Joey Robert, Johnny Coultas and Ronan and Phoebe, we not only met our goal of $500 for ACD Research on #GivingTuesday, but we *exceeded* our goal for a total of $740 as of right now! The day is not over yet if you would like to make a donation to find the cause of and cure for ACD in honor of a loved one. THANK YOU to our incredible ACDA community for your fantastic support on #GivingTuesday in 2017!! Update (November 28, 2017, 12:00 p.m. EST): Thanks to generous donations in honor of Sadie Rose and Xzendria Leigh, we’re 80% of the way to our goal of $500 for ACD research on #GivingTuesday! Please help us cross the finish line! As always, thank you for your support. Update (November 28, 2017, 6:00 a.m. EST): The day is finally here! #GivingTuesday is a global day of giving and kicks off the charitable season when many focus on their end-of-year giving. It is the ACDA’s sincerest hope that one day no additional family will have to endure the holiday season without their child as a result of ACD. 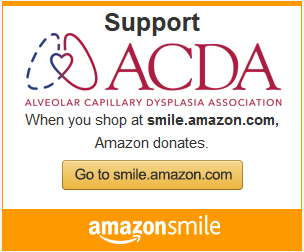 Please consider a donation to support ACD research on #‎GivingTuesday‬ by DONATING HERE. Your gift can easily be designated in honor of a loved one and an acknowledgement letter will promptly be sent by the ACDA to the appropriate family. The ACDA is a 501(c)(3) non-profit, tax-exempt organization. We encourage you to check with your Human Resources department to determine whether your employer offers Matching Gifts (Tax ID# 46-2915711) to maximize your contribution. Stay tuned for updates on the amounts received by the ACDA on #GivingTuesday!‬‬‬‬ We thank you for your continued support of our very important mission. Background: It seems the holiday season begins earlier every year, but the frenzy of shopping truly launches the day after Thanksgiving, commonly known as #BlackFriday. As more and more people began to turn to online shopping, #CyberMonday emerged too. Although all this shopping is done in the name of giving gifts to loved ones, it sometimes feels like the goodwill of the holiday season fades into the background. In 2012, a few nonprofit professionals decided to do something about it and raised over $10 million in the inaugural event. But Giving Tuesday was just getting started. By 2016, the giving day raised over $177 million online. The biggest giving month of the year is right around the corner. In fact, about a third of all charitable giving happens in December. Please help us successfully kick off the holiday giving season by promoting the #GivingTuesday campaign on November 28, 2017 in support of the ACDA.